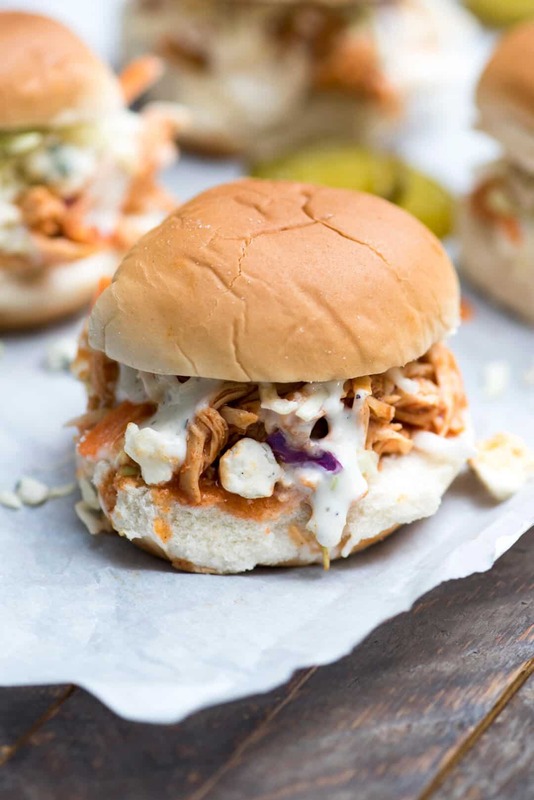 These Slow Cooker BBQ Buffalo Chicken Sliders may be small but they come packin’ big flavor! 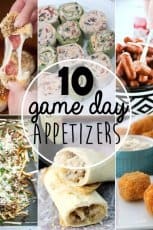 A fabulous make-ahead choice for your game day gathering. 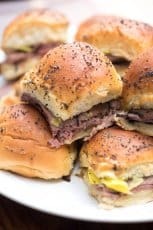 These sliders are insanely good and so, so easy to prepare that it makes me giddy. 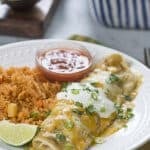 I sent out a survey to my email subscribers a couple of weeks back asking what type of recipes you all would like to see coming your way and the response was wonderful. Thank you SO much to those that took the time to take the survey! You guys are the best. 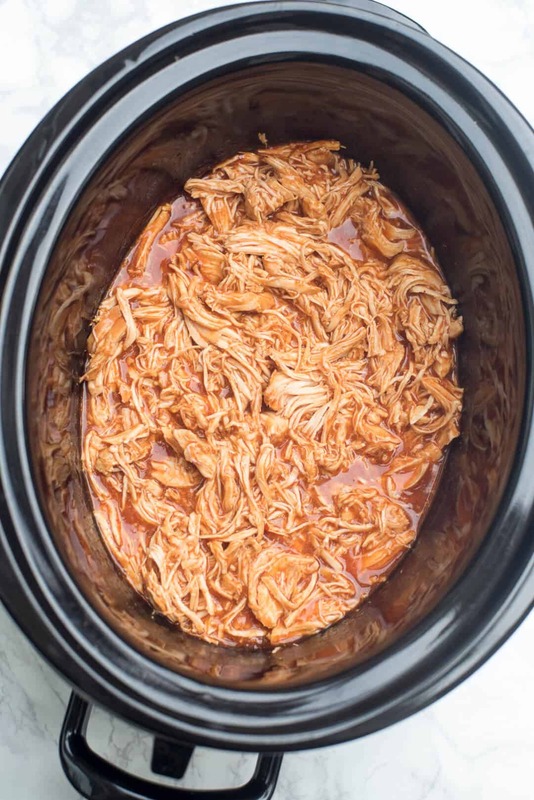 A whopping 64% of you requested more slow cooker recipes – oh happy day! 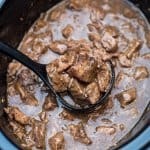 Slow cooker recipes are some of my very favorite recipes to create AND to cook in my own kitchen and I promise you’ll be seeing more of them in the coming weeks. 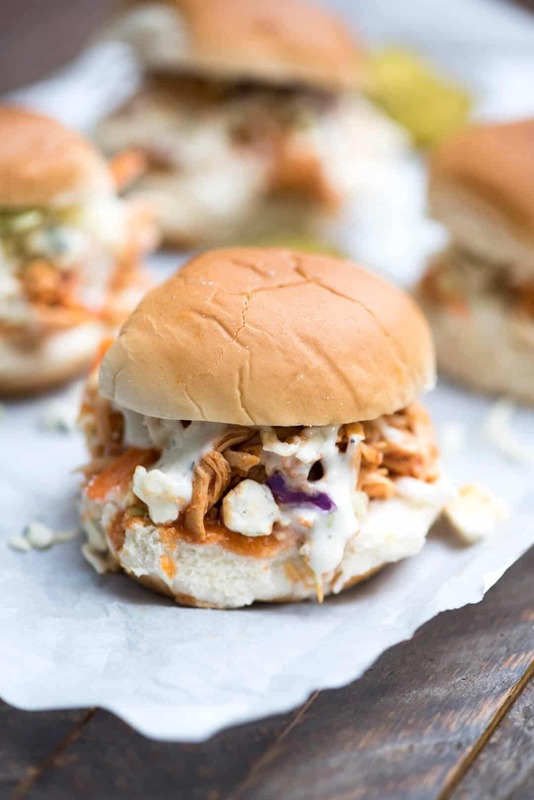 Last week I shared one of my new favorites, Slow Cooker Chicken Tikka Masala, and today I’m keeping the slow cooker recipes coming with these Slow Cooker BBQ Buffalo Chicken Sliders. 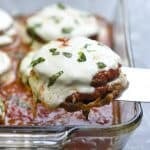 They’re perfect for Super Bowl Sunday or an easy weeknight dinner. I’m also working on some easy one-pot dinner ideas and some healthier choices to help keep you on track in the new year. Stay tuned! 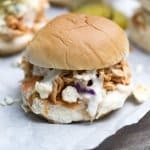 There is an abundance of buffalo chicken recipes out there but I’ve done something a bit different here that makes these sliders stand apart. 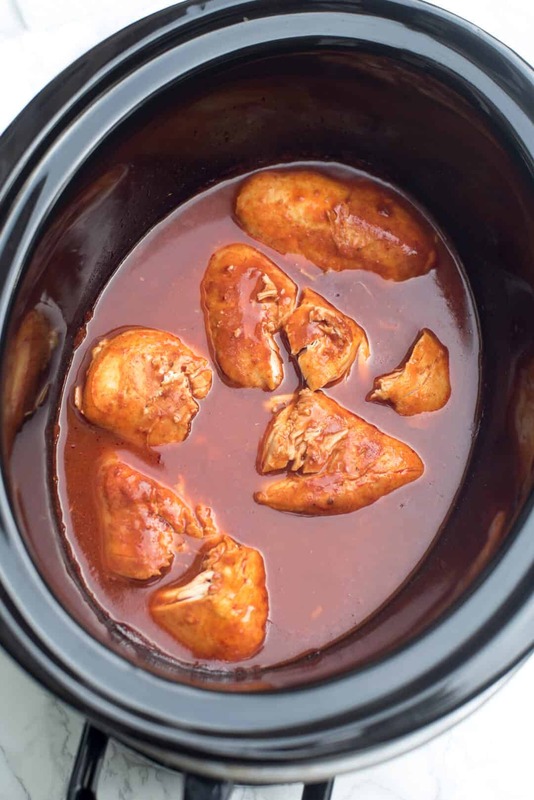 Chicken is slow cooked in a mixture of buffalo wing sauce and BBQ sauce for an out-of-this-world flavor combo. Cutting the spicy buffalo wing sauce with BBQ sauce also helps to temper the heat and while still a bit spicy, it makes these sliders far more crowd-friendly. Crunchy coleslaw mix and a drizzle of Ranch dressing also helps to balance the heat and crumbled blue cheese finishes them off to create the perfect game-day flavor package. You’ll need 4 good sized boneless, skinless chicken breasts and a bottle of buffalo wings sauce. I highly recommend Frank’s Redhot and honestly, is there any other? Frank’s makes a variety of different sauces so be sure you pick up the Buffalo Wings Sauce. 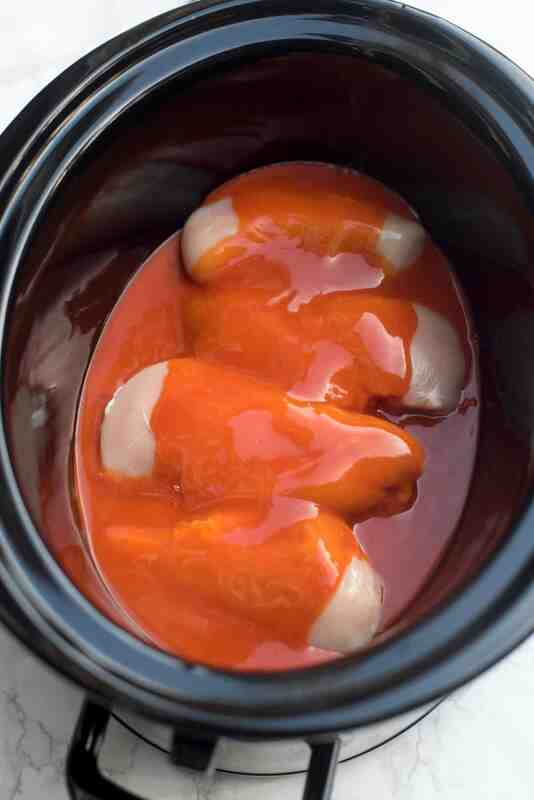 Pour 1 cup of the sauce over the top of the chicken in your slow cooker. 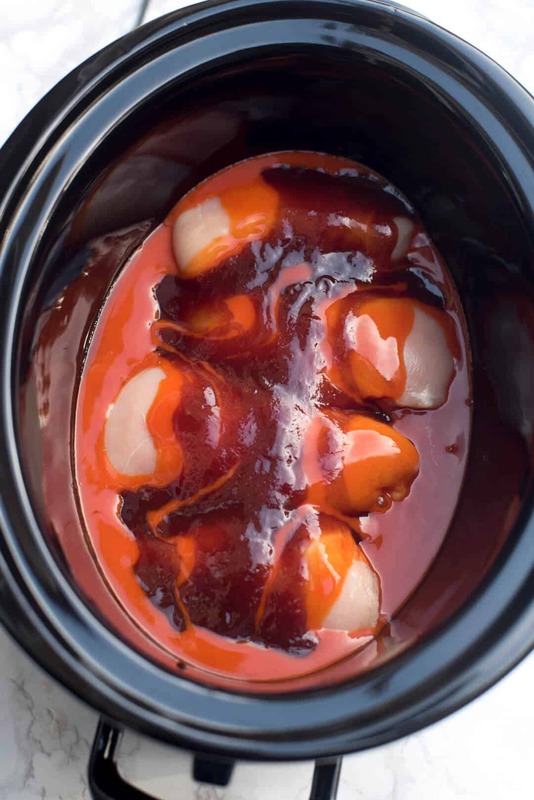 Add 1/2 cup of your favorite mild BBQ sauce. And, that’s it. There is so much flavor here you do not need any additional seasoning. Cover and cook on LOW for 6 to 7 hours. When the chicken is fork tender and easy to break apart you are ready to shred. Use a couple of forks to shred the chicken into the sauce mixture. Pile the chicken on slider buns, top with undressed bagged coleslaw mix, a drizzle of Ranch dressing, and blue cheese crumbles. I realize that game day typically means diet splurge day for most of us however, if you go with light Ranch, these sliders are pretty low on the guilt scale as far as game day fare is concerned. All the classic buffalo chicken flavors with no butter, no fatty skin, no grease. Yum-yum and win-win! 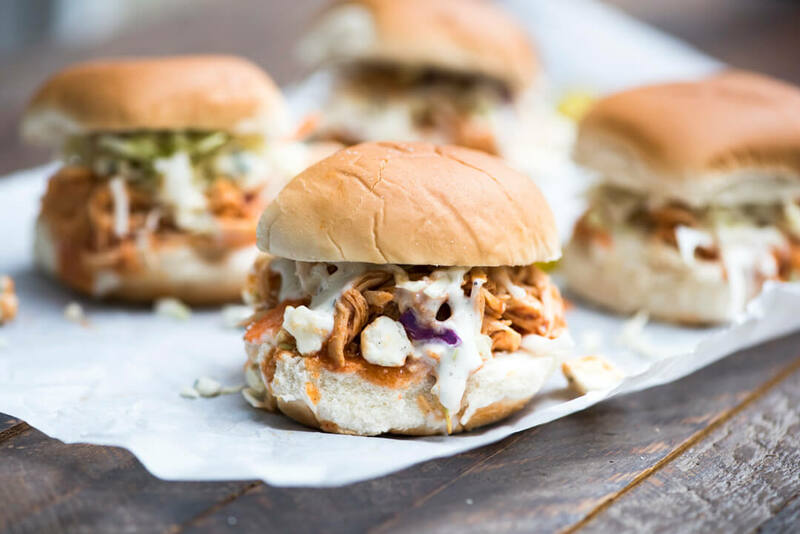 These Slow Cooker BBQ Buffalo Chicken Sliders may be small but they come packin' big flavor! 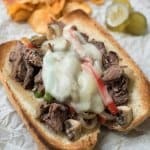 A fabulous make-ahead choice for your game day gathering. 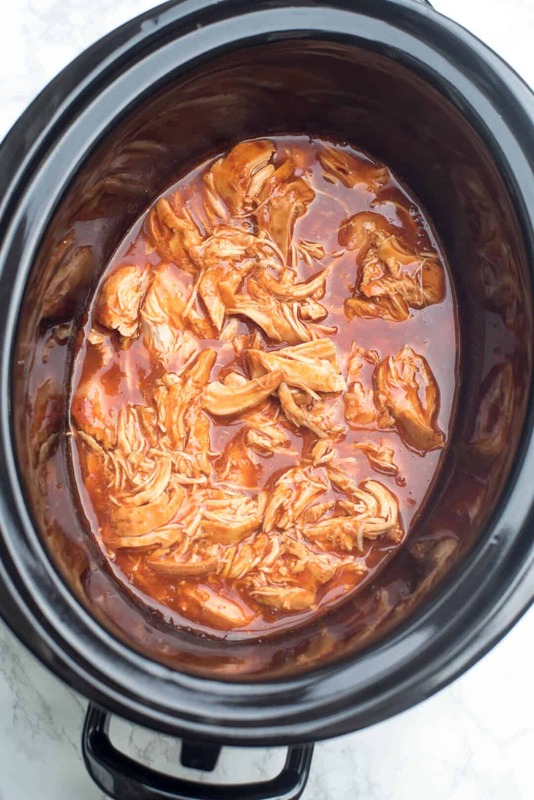 Place chicken in a 6-quart slow cooker and pour the wing sauce and BBQ sauce over the top. 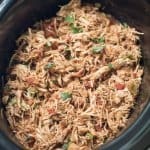 Cover slow cooker and cook on LOW for 6 to 7 hours or on HIGH for 4 to 5 hours until chicken shreds easily with a fork. Shred chicken and toss with the sauce. 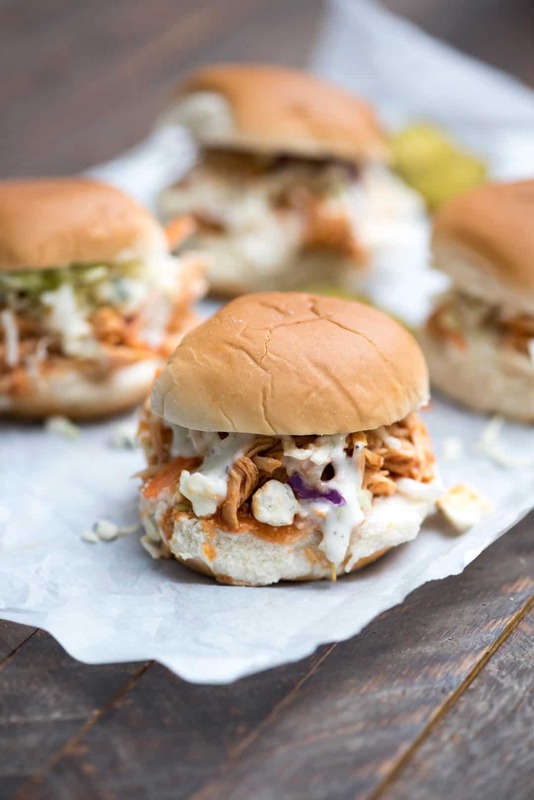 Serve on slider rolls topped with coleslaw mix, a drizzle of Ranch dressing, and some blue cheese crumbles. Oh yum, these look delicious Valerie! How did you know what I wanted to make this weekend? Thanks for the simple but delicious recipe. 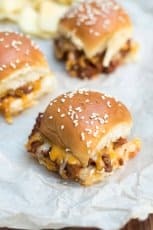 These sliders are delicious! I made these for my granddaughters 18th birthday party and we are having the leftovers for Super Bowl. 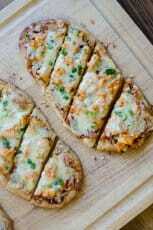 We had them on Hawaiian sweet dinner rolls and it was a nice combination with the heat from the buffalo sauce. 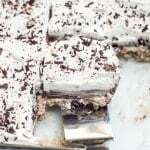 Thanks for sharing this recipe it’s soon to become a family favorite! !